Argentinian pianists Martha Argerich and Nelson Goerner gave a brilliant performance of 19th and 20th century piano music in this Edinburgh concert, leaving little to be desired by the end of the evening. The programme began with Mozart's Sonata in D K381 for four hands, as an immense sense of calm permeated Usher Hall. Argerich and Goerner achieved a wonderful balance together; Goerner's light touch provided just enough pressure in the melodic primo, while Argerich provided a solid secondo support. Rachmaninov's Symphonic Dances for two pianos offered something a little more substantial, rich in character and flavour as they are. The three dances not only reference Rachmaninov's First Symphony but are also symbolic of the great composer’s life experience. The first dance began with a haunting melancholy, leading into an energetic passage, and finally transforming from minor to major with a renewed sense of calm. The second was unrelenting, as continuous walls of sound flowed in and out of each other. And the final dance was full of the vigorous strength and power Rachmaninov is known for. Argerich and Goerner demonstrated extraordinary levels of contrast and depth; this was a mature and impassioned performance of a dynamic work. The Schubert Rondo for four hands, with its simple, playful tune, began the second half of the programme. It is at these moments that Goerner stood out with his delicate, melodic lines. But it was the final Ravel works that really hit the mark. The five dances of Ma Mère l'Oye for four hands were nostalgic of childhood stories, with their lingering melodies. La Valse, arranged for two pianos, was a clear highlight following the Rachmaninov. The transcription readily suggests the richness of the orchestral original. Both pianos created a lush soundscape, which entered depths far beyond the keys, with a wonderful contrast between the heavy, rumbling bass and the lightness of the waltz. Toward the end, quiet glissandos, gentle in character, crescendoed to a triumphant climax back to the melodic waltz, suggesting that Argerich and Georner were unstoppable. And indeed, the evening did not stop there. The pianists happily offered three encores much to the audience's delight. It was clear that most of the audience were there to see Argerich in all her glory, but credit must be duly granted to Goerner, who was a tremendous partner, playing well off of Argerich's strengths while showcasing his own. 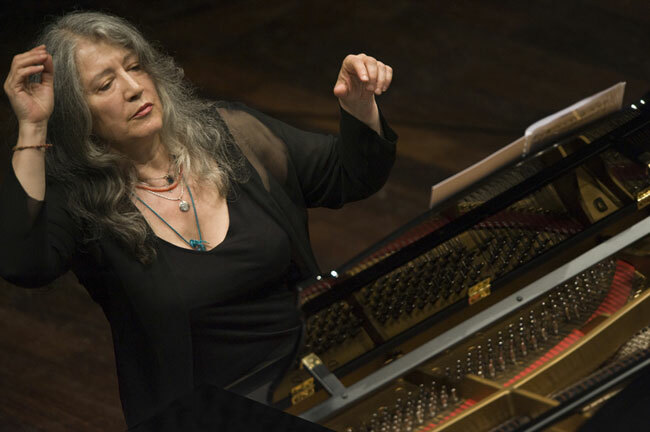 Where Argerich presented a more serious passion and intensity, focusing all of her experience into the performance, Goerner offered a more playful, animated persona at the appropriate moments. Together they formed an irresistible unit, becoming something like extensions of each other and the piano itself.